What is European Beech wood? Does Beech wood make good furniture? Why buy solid Beech wood furniture? How is solid wood furniture made? Why is solid wood furniture expensive? What is commercial grade fabric? What are double rubs in fabric? Is European Beech solid wood furniture sustainable? How to clean solid Beech wood furniture? Where to buy commercial quality solid wood furniture? 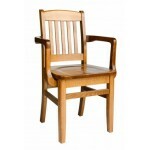 How is commercial solid wood furniture different from retail wood furniture? Known as the “Queen of the Woods” because of their large size and majestic appearance, European Beech wood trees commonly grow to 100 feet high, with a trunk diameter of up to 4 feet. The European Beech tree is sustainably grown throughout Europe, and is an important and widely-used hardwood in European countries. Its hardness, strength, durability, superb bending capabilities, and low price make this hardwood the first choice of many European woodworkers. Beech has a pale cream color, sometimes with a subtle pink or brown hue. The wood grain is straight, with a uniform texture to it. There is a slight natural luster to European beech wood that allows it to look stunning even with a clear finish. Solid European beech wood makes ideal furniture for commercial use, and with proper maintenance, beech wood will look beautiful for many years. One trait of beech wood that makes it attractive is a relatively clean surface presentation – there is only a mild graining, which allows the beauty of the finish and upholstery to take center stage. The density of European beech wood is also appealing. Beech is a relatively non-porous wood with a strong surface, which means that beech wood furniture will hold up well over time. Solid beech wood is often referred to as a “hard-wearing” wood, meaning that furniture made of beech can withstand a lot of pressure over time. Additionally, the hard surface of European beech wood will resist gouging and chipping better than many other wood types. 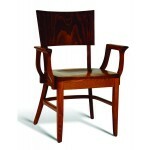 Furniture made from solid wood is extremely resilient and requires very little maintenance. All wood used for furniture construction needs to be properly dried to a certain humidity level to help prevent the wood from future splitting. This drying process is done through a combination of air drying and kiln drying. Joint construction is the main indicator of quality furniture. Anything held together with staples or nails is shoddy construction. The best joints are either dovetail or mortise-and-tenon. Solid wood furniture is commonly made by craftspeople who value attention to detail, many of whom are using centuries-old techniques. 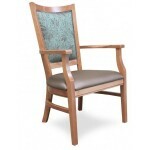 Solid wood furniture is built to the highest quality standards. Due to the craftsmanship and meticulous attention to detail involved, this type of furniture is more expensive than laminate or composite wood furniture. Wood furniture quality is mainly determined by two characteristics: method of joining parts of the frame and overall sturdiness of the chair, bar stool, or bench. All of our European beech solid wood furniture is hand-crafted with mortise-and-tenon joinery, and is guaranteed to be reliably sturdy in commercial environments. The highest quality wood furniture generally features a wood finish comprised of three main steps: sanding, staining, and finishing. If any one of these steps is not done properly, your furniture finish may look dull, blotchy, or cheap. 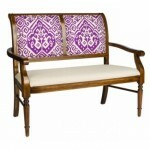 All of the custom made solid wood furniture sold at ContractFurniture.com is crafted of high quality solid European beech wood that is sustainably harvested. 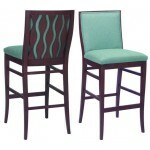 Our custom upholstered chairs and bar stools are manufactured to meet national standards for fire retardancy of upholstered materials and foam padding. Our furniture frames are coated in a UV finish that is more durable and longer lasting than paint, has a higher abrasion and stain resistance, is environmentally safe, and is inherently water resistant. Also, each of our seat panels are made from plywood, not particleboard. All of these traits work to set us apart as a top beech wood furniture supplier in the hospitality industry. The term fabric “grade” in the commercial furniture industry refers to the cost of the fabric, rather than its durability. Factors that influence cost include: fabric materials, fabric patterns, and manufacturer pricing. Commercial grade fabric has been abrasion tested to ensure long-lasting use in commercial environments. For industry professionals, double-rubs is also called abrasion data, which is vital when you are selecting fabric for upholstered furniture that will be subjected to high traffic in commercial environments. Abrasion data, or double-rub, is a method of testing that uses a specialized machine to pass a testing pad back and forth over the fabric until it is worn out. This testing pad is meant to simulate the fabric that a customer might wear in your restaurant or hotel. Each back-and-forth pass of the fabric pad on the upholstery is known as a double-rub. Commercial grade fabrics typically wear out after 100,000 to 250,000 double-rubs. Yes, European beech wood furniture is sustainably grown. Forests across Europe have experienced the world’s largest increase in standing timber due to federal laws such as Germany’s Forestry Act. These laws ensure that the amount of wood harvested never surpasses the amount of wood growing back to take its place. Intentional forest regeneration is a significant part of these efforts. 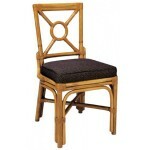 European beech wood chairs and bar stools is furniture you can feel good about purchasing. Periodically dust your solid wood furniture with soft, lint-free cloths. Avoid feather dusters, which sometimes have sharp quills that may scratch the wood surface. Dust in the direction of the grain. Years of doing this helps maintain distinctive patterns in the wood. It is best to clean the furniture in stages, starting with a mild cleanser that poses no risk to the wood finish, and graduating to a stronger solution only if the gentler one does not provide the desired results. Note: Always test on a discreet area of your furniture, such as the back of a chair leg. Add a drop of mild, clear dish soap to a water-moistened cotton ball. If the soap mars the finish in your test area, then continue without it. If the test area shows no evidence of damage, it’s safe to proceed. Combine water and small amount of liquid soap in a bucket and use this solution to sponge down the entire piece. Be careful not to soak the wood. Wipe the sponge lightly over the wood surface and don’t let the liquid linger for very long. Dry thoroughly with a soft, lint-free cloth. Using the upholstery brush attachment, vacuum side-to-side in short, overlapping strokes. Start at the top of the piece and gradually work toward the bottom. Note: For delicate fabrics, be sure to set the suction level to low. Using the crevice attachment, vacuum under cushions and around all upholstery seams. Next, use a can of compressed air to forcefully remove dirt from tufting and button nooks. If there are stains on your upholstery, pour about ½ teaspoon clear dish soap in a small bucket, and briskly run warm water into the bucket to create lots of suds. Note: It’s important to test the soap/water solution on an inconspicuous area of the fabric. Dip a soft upholstery brush in the suds only—do not submerge—and gently sweep the fabric in small sections. You do not want to soak the fabric. After you’ve brushed the entire stained area, wipe the fabric with a clean, damp cloth. Let the upholstery dry completely before using the furniture piece again. 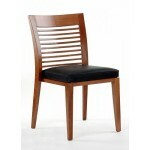 Contract Furniture Company is an ideal place to purchase solid wood furniture for your restaurant or hotel. 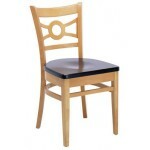 Not only do we have the largest collection of beech wood dining chairs, bar stools, and benches, we also sell our commercial-quality furniture at competitive industry prices. 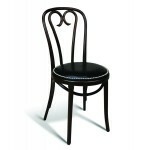 It’s easy to search the internet for providers of wood restaurant chairs and to find a large selection of vendors. However, all commercial wood furniture is not created equally – in general, you get what you pay for. 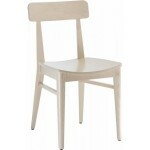 Many competitor sites try to pass off Grade B or C furniture as high-quality. 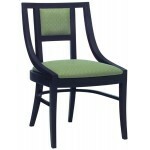 At Contract Furniture Company, we sell only Grade A commercial furniture. We stand behind our products, and our focus is on providing furniture of lasting value. Commercial furniture manufacturers must take into account the high usage their furniture will undergo, and are held to rigorous standards when designating furniture “commercial grade”. Retail manufactures are not held to these standards. Unlike retail grade, commercial grade furniture is manufactured to withstand a minimum of 250 pounds. Often, the weight limit exceeds this and the commercial furniture can support an even greater weight. With commercial furniture, the amount of time an item takes to burn during a fire is strictly measured. There are fire code restrictions on fabrics and furniture in a commercial space – see TB 117 and TB 133 for specifics. These restrictions apply to any upholstery or cushions that might be placed on your custom upholstered solid wood furniture. All fabrics and upholstery used in commercial furniture undergoes fabric tests to ensure that it won’t wear thin too quickly. The contract (commercial) upholstery minimum rub count is 15,000 double rubs, with the most fabrics falling between 15,000 and 30,000 on average. For retail grade fabrics, between 3,000 and 9,000 double rubs is considered standard. 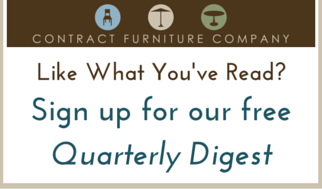 At Contract Furniture Company, our double rub count averages between 30,000 and 200,000. A reputable commercial furniture manufacturer will use only the best wood for their solid wood furniture, while a retail furniture manufacturer will use a lower, less expensive grade wood species. Good contract furniture is constructed completely by skilled craftspeople, and the items are shipped from the manufacturing facility fully constructed – table bases are an exception to this rule. Most retail grade furniture is shipped KD (knocked down), which can lead to issues with structural integrity down the line. Quality commercial furniture manufacturers will stand by their products with a replacement warranty, with the knowledge that their furniture will see a lot of usage. Because most retail furniture is designed for use in environments where it will see significantly less traffic, warranties often aren’t offered and/or generally don’t cover much.